After 55 years of the Surveying Business, Gene Raphel has retired in 2008. We are pleased to announce that Dietz Surveying has acquired all of E.F. Raphel & Associates Surveying Records and Files. It was a great pleasure and honor to work with Gene over the past few years, prior to his retirement, he was truly not only a good man, but a fine surveyor. On January 7, 2011 Mr. Gene Raphel has passed away at the age of 90. The volume of people that showed up to pay their last respects was an indication of just how many people he touched. Mr. Raphel, the son of a businessman and a homemaker, was born on Woodbine Farm in Upper Falls. After graduating in 1937 from St. Stephen School in Bradshaw, he began his lifelong career in land surveying with the Roland Park Co. In 1939, he went to work for what was then Whitman, Requardt and Smith, designing and laying out the railroad network for the wartime expansion of Edgewood Arsenal. As a member of the U.S. Engineering Department from 1940 to 1942, he worked on the surveying of the Lend-Lease area in Bermuda and performing offshore hydrographic sounding for a proposed air base. After completing his work in Bermuda, he was sent to survey the initial route for the Alaska-Canadian, or ALCAN, Highway through British Columbia and the Yukon Territory to the Alaska border, which took on greater strategic importance after the Japanese bombing of Pearl Harbor and the outbreak of World War II. Over the objections of the U.S. Engineering Department, which felt his work was of critical importance to the department, family members said, he decided to enlist in the Army in 1943. As a member of the 1921st Airborne Engineer Battalion, Headquarters Company, 806th Engineer Aviation Battalion, he was deployed to the Pacific and fought in the battles of Saipan and Okinawa. Returning to Baltimore after being discharged from the Army in 1946, he resumed his career when he formed a partnership with W.H. Primrose & Associates. 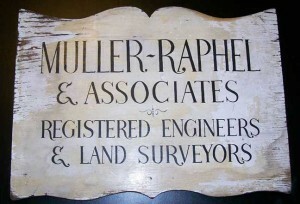 In 1953, he established his own firm, along with his cousin Augustus ‘Gus’ Muller, Muller – Raphel and Associates. 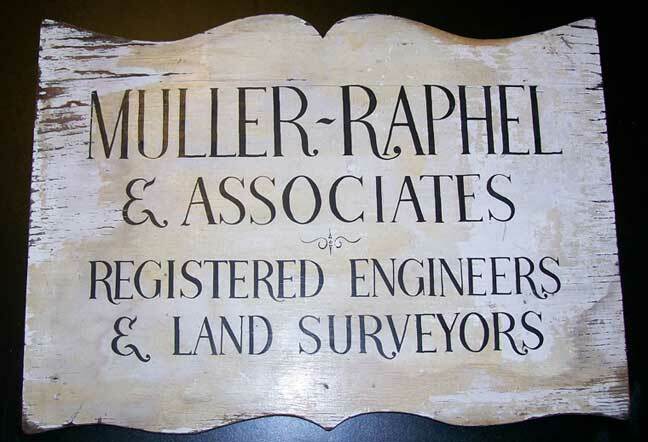 Around 1966, Gus Muller left the partnership and E.F. Raphel and Associates was started. Gene continued surveying until retiring in 2008 and closing his business. During his 55 years he performed survey work for the federal, state and county governments as well as numerous commercial firms, developers and private individuals. He was noted for giving Baltimore County a hard time. When they would say it can’t be done, he would find a way to get the job done.